Plymouth have produced pretty much a mirror image of their efforts from last season, with a horrendous start to proceedings making way for an impressive second half of the campaign. In fact they gave themselves even more of a mountain to climb this time, as a 2-1 defeat to AFC Wimbledon on Boxing Day saw Derek Adams’ side sitting bottom of the table, with just 20 points from 24 games. The previous season, Argyle had begun their change in fortunes slightly earlier, sitting third bottom in November after claiming just four wins from 20 games. They then made a dramatic improvement, with a run of nine victories in 11 games Argyle eventually finish seventh, just three points outside of the play-offs. This time around, it has taken the new year to roll in for Adams’ side to get their act together, with four wins in a row, three at home, breathing life into their season. A 1-0 defeat at Wycombe followed, before the Pilgrims won at Peterborough and drew with both Portsmouth and Bradford. They also thumped Rochdale 5-1, although suffered a first defeat in four matches at Sunderland last weekend, going down 2-0. At home, the Pilgrims are something of a force, unbeaten in five with four triumphs, scoring 13 goals in that time, as they have moved up to 14th, although aren’t completely safe just yet, only four points above the dotted line. Like Town chief Mick Harford, Adams was nominated for his second successive manager of the month award, missing out yet again, but can look back on a year sthat has seen six wins, two draws and two defeats so far. During Plymouth’s poor start to the season, they were hammered 5-1 at Kenilworth Road, something that still sticks in the mind of top scorer Freddie Ladapo. He told the Plymouth Herald: “I think we all really struggled in that game, I don’t think I saw much of the ball because they had it for the majority of the game. “How we started off that game wasn’t in the best way, we conceded too early and then kept conceding and we weren’t really tight as a collective. “They’ve had a great season, their unbeaten run stretches to over 20 games and I know when you’re up the top, you come to games with a buzz and I think we are going to have to match that buzz and that desire that they’re going to bring. Team news: Barring Glen Rea’s knee injury, Luton have a clean bill of health for the clash at Home Park. For Argyle, goalkeeper Kyle Letheren could well be fit after going off late on in the Sunderland defeat with a groin problem, with Jamie Ness close to a return as well. Connor Grant is out after injuring his thigh in midweek, while Joel Grant is missing and defender Lloyd Jones can’t play against his parent club. Top scorers: Hatters – James Collins (20). Argyle – Freddie Ladapo (15). Milestones: Luton will make a 50th visit to Home Park this weekend. Games between the two side started back in the Southern League with the Hatters going 34 years and 21 games without a victory in the beginning, until a 4-2 triumph in 1937 with goals from Frederick Roberts (2), Joe Payne and Edward Vinall. Since then they have picked up 10 wins, 10 draws and lost 29 of the 49 encounters. Man in the middle: Darren Drysdale – taken 30 games so far this season, showing 103 yellows and three reds. Refereed one Luton match, the 1-1 Checkatrade Trophy game with Southend at Kenilworth Road, the visitors winning 4-2 on penalties. Officiated Town Luton twice last season, a 2-1 home defeat to Accrington and then the 4-0 home win over West Ham U21s in the Trophy. Assistant referees are Kevin Howick and Marvyn Amphlett, with the fourth official Daniel Lamport. In charge: Derek Adams - 43-year-old who spent virtually all of his playing career, but for a brief spell at Burnley, north of the border. Became player-coach at Ross County in November 2006, promoted to player-manager the following year. 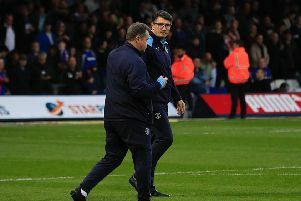 Returned to Ross County in May 2011 as manager, guiding the side to the Scottish Premier Division, eventually leaving the club in August 2014 and after a spell out of the game, was named Plymouth boss in June 2015. View from the opposition: Derek Adams talking to the Plymouth Herald - “They have done very well this year. Mick Harford has taken over and he’s an experienced man. “I have known him for many years. I met him a number of times when he was been up scouting in Scotland. “He’s a really nice gentleman, but he wasn’t the nicest gentleman when he was on the pitch. “Off the pitch, he’s a really nice guy. He was a top player. “We obviously have to limit them to not many opportunities on goal and then we have got to play in a way where we are going to create chances. Friendly faces: Imposing defender Sonny Bradley played 96 times, scoring 11 goals for Plymouth after joining them from Crawley in the summer of 2016. Headed to Luton in July last year and has played 39 times for the Hatters, although is yet to score. Striker Jake Jervis racked up 127 appearances for the Pilgrims after joining from Ross County in June 2015. Scored 31 goals in his two and a half year stay, moving Luton for an undisclosed fee in January 2018. Not found the net in his new surroundings, loaned to AFC Wimbledon in August, netting twice in 30 games so far. Defender Lloyd Jones started his career with Plymouth before Liverpool snapped him up in 2011. Never made a first team appearance for the Reds, with Luton signing him for an undisclosed fee in January 2018. Recently returned to Devon on loan, limited to just one substitute appearance. For the Pilgrims, keeper Matt Macey joined on loan from Arsenal in the summer of the season and has made 29 appearances. Featured 13 times for the Hatters on loan in the 2016-17 campaign after joining when Christian Walton was recalled by Brighton. Played for both: Olly Lee – midfielder joined Plymouth on loan from Birmingham for two spells, making his debut in the 1-0 home defeat to Luton in March 2015, going on to play 15 times, scoring twice. Left Argyle in August 2015, heading to Kenilworth Road where he went on to play 123 games for Town, netting 11 goals, including one from his own half against Cambridge. Notched the goal that saw Town seal promotion to League One, but left in the summer, heading to Scottish Premier League side Hearts. Has played 34 games for the Jam Tarts so far, scoring six goals including the winner against Hibernian recently. One to watch: Ruben Lameiras - former Spurs youngster went on loan to Atvidabergs in Sweden during his time at White Hart Lane and then moved to Coventry in July 2015. Spent two years with the Sky Blues, scoring just three times in 56 league games, heading to Home Park in June 2017. Bagged six goals in 37 appearances last season, but has found his shooting boots this term. Netted four times before Christmas, then burst into life after scoring in the 1-1 draw at Burton, going on to notch in four successive games, with six goals. The winner at Peterborough means he is now on 11 for the season. We’ve got form: Town’s recent run at Home Park has been excellent, winning the last three trips without conceding a goal. Andy Drury and Jack Marriott sealed 1-0 victories in 2015 and 2016 before the last visit was even better, a thumping 3-0 success. Before then it wasn’t quite as happy a hunting ground, with four defeats in five during 2000, as more often than not, Town have been on the wrong end, making the lengthy drive back empty-handed. Last time out: The Hatters started the 2016-17 season with an excellent opening day win at Plymouth. Goalless at half time, Danny Hylton put Luton in front with his first goal for the club on 50 minutes, while Jack Marriott sped through to add the second on 69. Dan Potts was harshly sent off for his second yellow card with a minute to go, but sub Jonathan Smith rounded off the victory when his shot slipped under Luke McCormick. Hatters: Christian Walton, Stephen O’Donnell, Dan Potts, Johnny Mullins, Scott Cuthbert, Glen Rea, Cameron McGeehan, Jordan Cook (Jonathan Smith 88), Pelly-Ruddock Mpanzu (Jake Gray 89), Danny Hylton, Jack Marriott (Olly Lee 89). Subs not used: Craig King, James Justin, Josh McQuoid, Isaac Vassell.